Book and Buy Tickets Online For all matches of the 3rd Edition of the Indian Premier League (IPL) which is starting from March 13 2010 at the D.Y Patil Stadium in Mumbai with the Current IPL Champions Deccan Chargers taking on Shahrukh Khan Owned Kolkata Knight Riders. You can Book and Buy IPL Tickets Online for all the 60 matches which are to be played in IPL 2010. 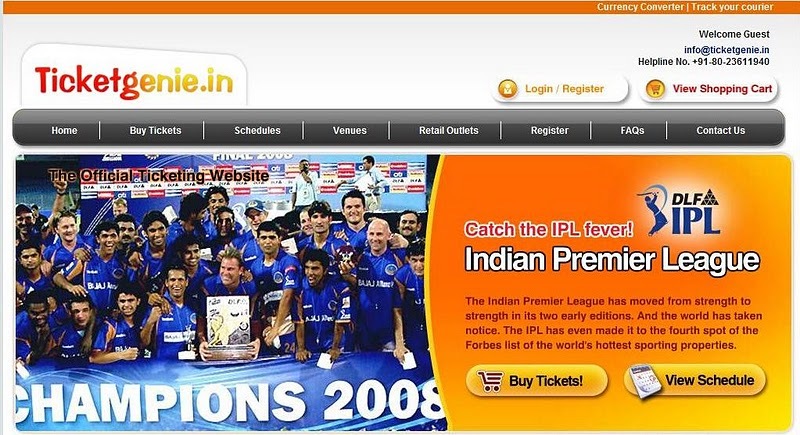 You can Book and Buy IPL 2010 tickets at www.ticketgenie.in which is the official ticketing site for IPL. Tickets can be purchased on the basis of Team, Venue and Dates. The price of tickets varies according to different stadiums and stands in a stadium. Ticketgenie offers multiple payment options like Credit Card, Debit Card and Net Banking. At purchase time, the customer receives two options, one for “Print at Home Tickets” and the other for “Delivery by Courier”.